We are looking for stories or poems that based in Edinburgh. They must be under 1300 words or up to 5 pages of poetry. Writers must not have had more than 1 book published – and we really welcome new writers. Stories/poems can be any style, theme, or genre. Authors who are chosen will receive £20 for their contribution and will retain all the rights. The stories/poems will be professionally recorded and geolocated in Edinburgh in the place where the story is set, using Podwalk. The platform will be launched in December, and will remain live on Podwalk for 1 year. In addition the stories will be placed on our website along with a short bio of the author. Deadline for submissions is Midnight 16 October 2016. This entry was posted in News, Prizes, prompts, Submissions, Uncategorized and tagged competition, Edinburgh, podcast on September 22, 2016 by a.curtis. The Walter Swan Playwriting Award is being run in association with the Ilkley Playhouse and the Ilkley Literature Festival and with support from the West Yorkshire Playhouse. It is planned that it is an annual event. All plays are to be submitted online through this website. The entry window will open on 1 February 2015 and close on 30 April 2015. This entry was posted in Event, Prizes, prompts, Submissions and tagged competition, Ilkley, playwriting, playwriting competition on January 20, 2015 by a.curtis. 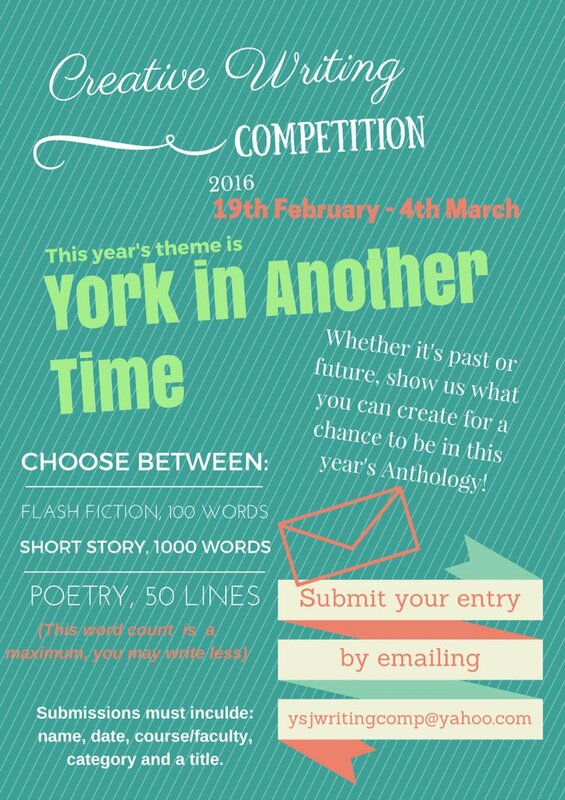 YSJ are hosting a creative writing competition for all students and staff at York St John University. It is a great opportunity to have your work published in the university anthology and begin establishing a name for yourself as a budding new writer. We want submissions for both prose and poetry, and there will be a winner for each category! The writing itself must concern York. It can be ANYTHING to do with York though, so there is plenty of scope. It could be to do with history, culture, politics or just a funny anecdote; the sky is the limit. Prose pieces must not exceed 1,500 words. Poems must not exceed 50 lines (equivalent to 1,000 words. All submissions must be sent before midnight on March 25th. Send submissions to YSJCompetitions@outlook.com and make sure to title the file with your name. Also include a cover sheet with your name, email address and course of study so we can get in touch if you win. The winner’s will be announced by the 31st of March and will automatically be given a place in the YSJ Creative Writing Anthology alongside creative writing graduates and MA student’s work , which is due for publication later this year. Please note: If you have already submitted a piece for the Anthology, you must not use that same piece in the writing competition. Also, any song lyrics or other plagiarised submissions will be disqualified. Best of luck, YSJ Writing Competition. Like the Facebook page ‘York St John Annual Creative Writing Competition’ for more updates and information. This entry was posted in Submissions and tagged competition, creative writing on March 12, 2014 by . The UK’s first national inter-university poetry slam championships – UniSlam! – will take place on Sunday 27 October 2013 at the University of Birmingham as part of the university’s literary festival. The competition will comprise heats, a semi-final, and a grand final, which will be staged in the 420-seat Elgar Concert Hall. The day will run from 12noon – 10:00pm, beginning with a workshop for all poets, heats, semi-finals, and a grand final between the top two teams. Each team consists of 4 poets. Each poet will perform one poem in their heat and semi-final, and two in the grand final, of a maximum length of 3 minutes. We’re delighted that accomplished poets Luke Kennard, Helen Monks, Matt Windle, and Martin Glynn are judging the competition, and Bohdan Piasecki is running the workshop and hosting the event. Entry to the competition and workshop is free, but we are unfortunately unable to offer any money towards your team’s travel or accommodation (should you need to stay overnight). I really hope that the opportunity to compete in the inaugural event and the chance to become the first ever UniSlam! champions is one that you will support, and that will benefit your students/members enormously. Please confirm your interest by emailing ben.norris118@googlemail.com as soon as possible. Places will be awarded on a first come first served basis. If you are selected to compete, more information will be sent to you. I look forward to hearing back from you, and to hopefully welcoming you to UniSlam! This entry was posted in News, Uncategorized and tagged competition, poetry on September 11, 2013 by . The Poetry Society’s National Poetry Competition is now open for entries. Enter online or by post. First prize is £5000! Deadline: October 31st, 2013 – midnight. This entry was posted in News and tagged competition, poetry on August 8, 2013 by .